Youth will explore the complex issue of economic justice in Memphis. Economic justice is advanced when economic opportunities are equitably available to citizens regardless of their race, religion, gender, ethnicity, nationality or socio-economic status. Activities and discussions work to build understanding how wage, income, budget and wealth affect individuals, families, neighborhoods and communities. Youth will discover how life experiences can affect short-term budget choices, which impact long-term financial goals. Youth will explore what it means to be leaders for environmental justice. Environmental justice is the equitable sharing of the environmental benefits of our natural resources and the environmental burdens of our industrialized, urban environment. Youth will define environment and explore different Memphis environments, and they will discover the impact when one community’s need is put before the needs of the larger community whole, affecting the balance between environmental benefits and burdens. Youth will explore and identify ways in which community members have stood up to advance environmental justice. Community leaders are individuals who build relationships with others, work together, and use collective strengths to make meaningful change. Youth will learn about the diversity and individual strengths within their group and the importance of bringing diverse talents and strengths into building community. Youth will teach each other about the communities they’re part of, identifying strengths within their community and the root causes of community issues. Youth will work together to create action plans towards affecting positive change in their communities. Who’s Leading the Youth? YOU! Leadership employs personal strengths, builds upon personal values and pursues visions that respect the needs of all individuals. Youth will engage in activities that require them to embrace their leadership skills and share them with the group in order to complete assigned tasks. Exploring the traits of young leaders who have affected social change, youth will identify the qualities, habits, and values that make of the “anatomy of a leader.” Youth will learn about four different ways to lead positive community change: direct service, education, advocacy, and community organizing. Ideal classrooms exist when students understand the “why,” and teachers set meaningful expectations, build in positive reinforcements, and build relationships between students and teachers. Youth and teachers will work together through fun and engaging activities that allow each to learn how to build and strengthen student and teacher voice in the classroom. Youth and teachers use their memory of a positive and negative classroom experience to share and recognize the value of each other as education experts. They will work together to design the ideal classroom experience. Youth will work together to learn more about each other, thinking about how others see them and how they see themselves. Youth will actively make connections between themselves and their peers beyond the superficial level. Youth will foster collaboration through exploring the concept of positive self-imaging and talking about issues that might be affecting their school experience. Youth will role play to explore the concepts of “up-stander” vs. “bystander” within the context of bullying and creating a healthy, safe school culture. Youth will have the opportunity to engage with each other through fun and interactive team-building activities focused on strengthening and building lines of communication and support while creating cohesion within participants and school culture. Youth will practice nonverbal interpretation and communication of ideas as they create strategies to overcome communication challenges. Youth will build active listening and critical thinking skills while working in a group and will leave the experience with a deeper understanding of their individual communication style and how it fits into and can benefit others. Youth will explore what it means to be leaders for environmental sustainability. 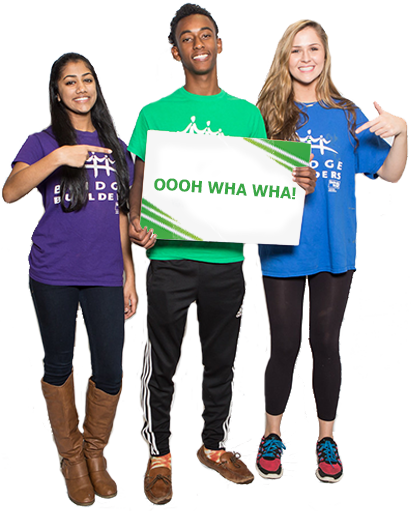 Through a hands-on, interactive tour of the Jim Boyd BRIDGES Center, youth will learn the concepts of green building design, including water conservation, energy conservation, sustainable resources, indoor air quality, and land use. Youth will identify opportunities for individual and collective action to promote sustainability and will discuss how to apply green building concepts to their homes and school. Youth will practice positive communication and teamwork.